7). The greatest tax increase on the middle class in the nation’s history (Obamacare contains 21 hidden taxes. New taxes. 7 of them are levied on ALL citizens regardless of income. And 14 additional ones will hit businesses and those making over $250,000. All of these taxes are necessary to supplement the Individual Mandate – also a “tax” according to Justice John Roberts – to pay for the President’s healthcare bill). 8). Greater demands on the wealthy to “pay their fair share” and greater sacrifices on those who are successful, causing them to reconsider major life decisions (such as getting married, buying a house, having children, having additional children, helping their children go to college, vacations, andpaying off debt, including college debt), while requiring no sacrifice on the part of those on entitlements (such as requiring an education, mandatory birth control, a transition to employment within 3- or 5-years, legal US status, drug screening, community service, making sure their children maintain a solid grade point average in school, etc). In other words, the dynamic will continue to favor dependency because the government rewards that behavior over success and hard work. 10). Appointments to the Supreme Court. One possibility is Hilary Clinton (who agreed to take the fall for Obama in the Benghazi attack of September 11th, during which the government allowed 4 American officials and former Navy Seals to be murdered by refusing to send help, which was already poised to be deployed). The threat this term, besides a Supreme Court decision upholding Gay Marriage and further eroding Religious Rights, is an attack on our Second Amendment rights. We can expect the administration to seek to define precise limits of this right with the intent of limiting individuals to the kinds of weapons they can possess, and how many and how much ammunition. 11). There is a rumor going around that Obama has his team of attorneys looking for a way to get around the constitutional limit of 2 terms as president. Will he attempt to make himself dictator – and fulfill the prophecy of the “Savior” to all those Americans who want the government to take care of them and to solve all problems? Adolf Hitler rose to power under similar circumstances. Be careful what you wish for. Let us not be so cavalier with the system that our Founders crafted for us, the one secured by the blood of over a million Americans, and the one that the rest of the world looks to. The dust barely settled from Tuesday’s election before attention turned, as it should, to the looming fiscal cliff threatening the U.S. economy in the new year. The election outcome didn’t change the fact that America is headed down a path to financial oblivion. In fact, awarding Barack Obama with another four years will most likely assure us of getting to that cliff. Economists have warned us that we have at most 4 years to turn things around or we will face a severe depression on the magnitude of that suffered by Greece. And we already see the market players’ response to the election, as reflected by the market’s sharp downturn in the election’s aftermath. They don’t have confidence in the Obama administration. They know his policies and they don’t see how our problems can be solved. Americans rejected the candidate with experience in turning debt and crisis around. The market downturn indicates that businesses and investors believe things will only get worse. Thanks to the political shenanigans of our elected representatives, a perfect storm of tax hikes and sequestration (which are automatic spending cuts) will hit all at once in January. All of the Bush-era tax rates will expire, sending the five tax brackets anywhere from 20% to 50% higher. The payroll tax cut will expire, costing the average worker over $1,000 next year. The Alternative Minimum Tax patch will also lapse, as will the lower death tax rate. More Obamacare taxes kick on, particularly on the already-targeted top-bracket taxpayers. Automatic federal spending cuts across the board (except for entitlements, of course) that will be triggered, and the defense cuts in particular, will hurt both our capability and the economy. Indeed, the day after the election, Boeing announced that its defense division will suffer a 30% cut in management jobs, and several facilities in California will close. For obvious reasons, the administration demanded that defense contractors wait until after the election to announce cuts. House Speaker John Boehner (R-OH) announced that Republicans would be open for a deal. He said that they might be open to increased revenues, but only if Democrats agree to keep income tax rates from going up and accede to reduced spending and entitlement reform. Boehner made clear that higher revenue should (and would) come from “a growing economy, energized by a simpler, cleaner, fair tax code, with fewer loopholes and lower rates for all” – which, of course, was the Romney-Ryan plan. The House Speaker added a day later, “Raising tax rates is unacceptable.” There was a time when a promise like that would be received with resounding approval by the American people. But in this new era of America – in Obama’s America – only half of Americans have to fear the federal income tax code. And so only those who enjoy the freedom from the code could care less when a tax increase is on the table. We expect an ugly fight from Democrats, who blew up the deficit only to complain that Republicans won’t play the role of tax collector to pay for it. This is especially true of Barack Obama, who has been making the case to the American people that Republicans won’t compromise, while it’s been the Democrats who haven’t put forth any budget plans and it was the Democrats who worked behind closed doors to pass Obamacare – without considering any input from Republicans (such as tort reform) and without a single Republican vote. President Obama would rather push the economy over the cliff than give up his “new economic patriotism” — i.e., the belief that the wealthy should pay higher tax rates. How many times have we heard his campaign pitch “The rich need to pay their fair share!” How many times should they pay taxes on their income or their gains? According to the Congressional Budget Office (CBO), those higher rates will hit small businesses extremely hard and likely result in recession. Also according to the CBO, the cliff will cause unemployment to spike beyond 9%. Meanwhile, massive deficits continue unabated. When Obama took office in 2009, the national debt was $10.6 trillion. As of Nov. 1, 2012, it stood at an obscene $16.2 trillion, and his budget proposals will push that number north of $25 trillion by 2022. The U.S. per-person share of government debt, according to the International Monetary Fund, now exceeds $53,400. That’s 35% higher per capita than Greece, which has seen a catastrophic economic collapse. The federal government has racked up more debt since 2008 than it did in the first 224 years of the Republic. In other words, it took all the presidents from George Washington to Bill Clinton to match the debt built up under Obama’s first four years. And as Michelle Obama tweeted before the election, “If this is what the President can do in 4 years, imagine what he can do in twice the time.” That should scare every right-thinking American out of his or her shoes. We simply won’t survive as a free nation. The wealth distribution that will have to result from such a transformation of our system or from an economic crisis will warp speed us into a socialist country. If that’s not enough, the Treasury Department noted last week that the government will again hit the debt ceiling by the end of this year. Yet the only plan Treasury has to address our ballooning debt is to continue printing more money to finance it. Inflation will continue to rise. Our national debt will soon be too risky for nations like China to purchase. The fact that the White House and Congress remain essentially unchanged after the election certainly doesn’t bode well for the nation’s economic plight. 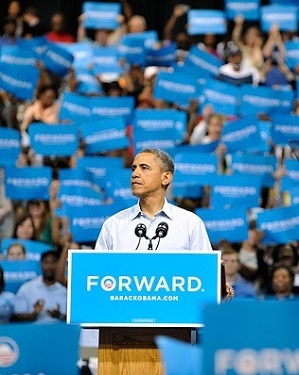 Obama undoubtedly views his victory as a mandate for more socialist policies and class warfare. In his second term, he will seek to complete what he set out to do in his first term – the fundamental transformation of the greatest nation ever created by man. What sins or failures of our past can justify this transformation? I’ve written many articles, but the one that is most popular is one I wrote on Secession in 2011. Never before in modern history have so many people taken an interest in secession and the division of the country into two separate nations. Why? They simply want to have at least one place that still is free and protects those that desire freedom above all else. They are not getting that in the United States anymore. So what do we do? Do we let tempers flare? Do we allow frustrations to intensify? Do we laugh at these “crazy people” and assume they are just venting? Do we take them as seriously as Barbra Streisand and Susan Sarandon and Alec Baldwin who promised to leave the country if George Bush was elected (but never left)? There is a breaking point, you know. We all know this from our own lives and from watching the news every time there is a workplace shooting or a suicide or a person kills his or her family because things are just so bleak. The more the Obama administration senses the frustration with government, the more it will seek to restrain the one right the people still have – the right to own and bear arms. The more the government senses frustration, the more Executive Orders Obama will pass to put government forces on alert to step in our states and into our communities to keep the peace. We are talking about martial law. So, what do we do? Do we perpetuate this cycle of government oppression and individual frustration? Do we let tempers flare and frustrations intensify and entertain the idea of a divided country? No, we offer them Thomas Jefferson’s remedy of Nullification and ask them to join the movement to peacefully end the “transformation” that Obama and others before him have done to destroy our constitutional republic. We ask people to study their history and remember that the nation was founded by individual states who came together to mutually concede which limited powers they would delegate to the federal government, for their benefit, so that they could find protection and prosperity in a Union. The federal government was supposed to respect their borders and individuality and not work feverishly to erase them and to establish a one-size-fits-all approach. The states who drafted, debated, interpreted, and ratified the Constitution (creating the federal government) are the rightful parties to declare what those powers delegated to the government are. Therefore, Nullification is power of the states to declare when the government has overstepped its legal bounds under the Constitution and to remind the government that without a rightful exercise of power (as the Supremacy Clause explains), the particular federal law, policy, or federal court decision is null and void and unenforceable on the States and its people. Nullification is the rightful remedy, as Thomas Jefferson articulated, to restore proper constitutional bounds of power and therefore secure individual liberty. James Madison articulated a similar doctrine – Interposition – which states that states are duty-bound to use nullification and refuse to enforce such law, policy, or decision within their borders. It takes good and decent, concerned citizens to make a difference. Recall the Sons of Liberty, with members such as Samuel Adams and John Hancock and Paul Revere and Patrick Henry. The Sons of Liberty, which started out as a small secret organization, set in motion a series of events that eventually resulted in our country’s independence. In fact, it’s most doubtful that the Revolution would have happened without this group of liberty-minded agitators. How did they get things rolling? They started with simple acts of civil disobedience – like protesting a tax on documents (the Stamp Act) and dumping some tea into the Boston Harbor because they opposed the tax on tea. They organized demonstrations, forced officials of the Crown to resign, circulated petitions, published newspaper articles, and distributed handbills. They started in Connecticut, spread to Massachusetts and New York, and soon there was a group in every one of the 13 colonies. When the stamps arrived in the colonies from England which would be affixed to various documents, including newspapers, pamphlets, deeds, licenses, and other legal documents, diplomas, bibles, calendars, and playing cards, the Sons of Liberty organized to threaten and intimidate those officials appointed to apply the stamps. Thanks to the Sons of Liberty, the Stamp Act could not be enforced. When the King responded with further oppressive measures – which Jefferson would refer to as “abuses and usurpations” of their rights – the patriotic resistance grew. By 1766, there were thousands of members in each colony. Soon others were encouraged to address their grievances against the Crown by similar acts of disobedience. And we all know what eventually happened. We fought the Revolutionary War and gained our independence. We don’t want another war but we do want our independence again. And Nullification is the answer. Otherwise, I fear, there will be a revolution. This entry was posted in Uncategorized and tagged $200, $250, 000, 10th Amendment, 2016, Benghazi, Bush-era taxes, business, business tax, dependence, election of 2012, embedded taxes, entitlements, Fair Share, Federalism, fiscal cliff, George Bush, gun rights, Hilary Clinton, Individual Mandate, interposition, Iran, Israel, James Madison, John Boehner, nullification, Obama, Obamacare, off-mic, oppression, president, Russia, Russian prime minister, second amendment, stock market, Supremacy Clause, Supreme Court, taxes, Thomas Jefferson, unemployment, wealthy, welfare.. Bookmark the permalink. 3 Responses to 2016: Obama’s America or The People’s America? Pingback: 2016: Obama’s America or The People’s America? | Why the TEA Party?